"Why don't you talk to me?" Pilate demanded. "Don't you realize that I have the power to release you or crucify you?" Then Jesus said, "You would have no power over me at all unless it were given to you from above. So the one who handed me over to you has the greater sin." Sin clouds our thinking. Sin tempts us to overestimate our abilities; then sin ensnares us in its deceitful and deadly web of death. Sin wounds others. And as Jesus reminds us here, not all sin is the same! Some folks have suggested that one sin is not greater than another because all sin separates us from God. While the latter part of that statement is true, the first isn't. Jesus' own people, people who knew the character and the promises of God, distorted their legal process, called down curses on themselves and their children, and honored a godless emperor as their king when they asked for God's Son to be killed. While Pilate's weakness and pandering to the crowd were definitely sinful, Jesus emphasized that the sin of the leaders of his own Jewish people was the greater sin. 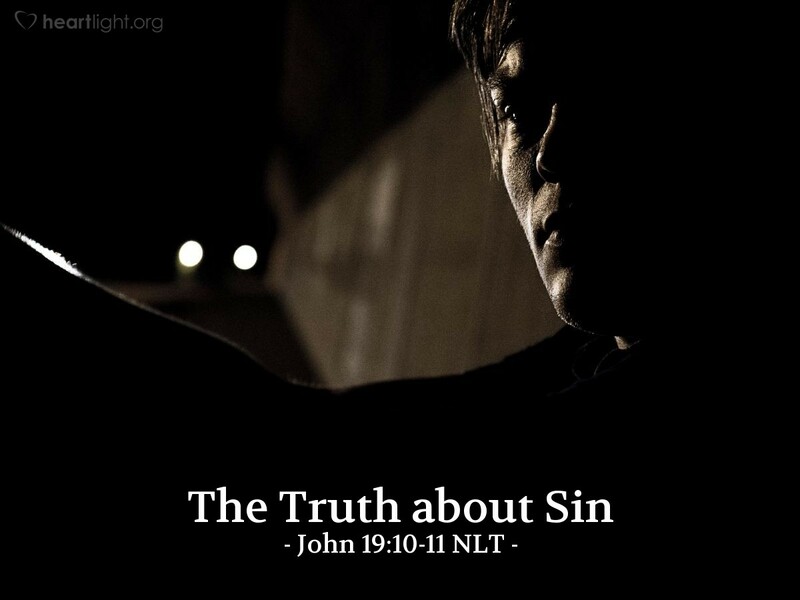 Sin matters to God — all sin and every sin matter to God! However, some sin involves our engaging others in sin and influencing others to sin. Some sin — especially that of parents, Bible teachers, and leaders — gets replicated and passed on as a sin problem to coming generations. Some sin involves our own bodies, the very temple of God through his Holy Spirit. So let's not be glib about sin. Instead, let's focus on doing what is right, saying what is true, and keeping our commitments to the God of all grace. And when we do sin? Let's acknowledge it before God, repent of it, and receive his gracious gift of forgiveness and cleansing. O LORD, God of the heavens and of the earth, you are a great and wonderful God, full of holiness and grace. Forgive me of my sin; I repent of my rebellion. I ask you for your forgiveness. I need the power of your Holy Spirit to both cleanse me and strengthen me as I seek to live for you. In Jesus' name. Amen.